If you ever wondered what an earless snow leopard, a snaggletoothed bat or the ultra-rare Assquatch looked like, then wonder no more. All of this and many more oddly stuffed critters from all over the world appear in Crap Taxidermy. Author Kat Su presents a hilarious celebration of rigor mortis in various states of many critters, both large and small. 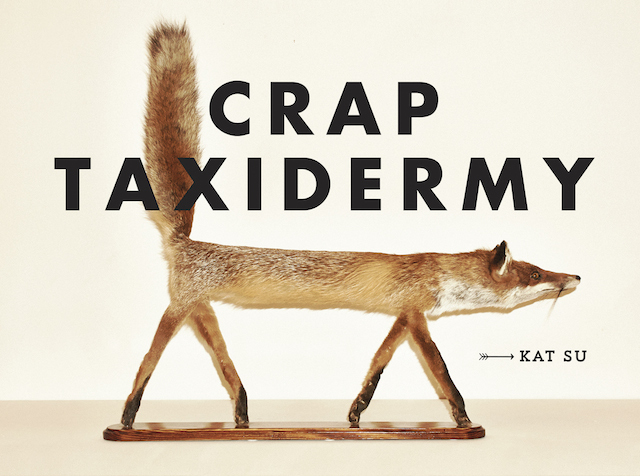 What started as a Tumblr page full of oddities has bloomed into this humorous picture book highlighting, well, the best of the worst taxidermy attempts imaginable. By the looks of these stuffed animals, there are more than a few eccentric taxidermists still perfecting their craft. Coming from all over the world, examples hail from the United Kingdom, Greece, Mongolia, Russia and Saudi Arabia. Great chapter titles include: It’s in the Eyes, Dynamic Poses, Grin & Bear it and Improving on Nature. There’s plenty of imagination on display… even if it’s not anatomically correct. Long-dead critters appear with incredibly creepy and sometimes googly eyes, an alien-eyed serval and even the Furious Wolpertinger on display, whatever that is. As a sum total, these creations are creepy, but more importantly, the reader will eventually wonder who would be proud enough to show off these prized possessions? The answer escapes me. The final chapter is basically an idiot-proof guide to stuffing a mouse. That’s necessary reading for all aspiring taxidermists and people who love mice dioramas playing poker or other similar activities. This is definitely a fun and quick read, sure to supply more than a few chuckles. I look forward to discovering more creepy creations by author Kat Su. I received this book from Blogging for Books for this review. Strength: Never dismiss the ingenuity (or sense of humor) of a taxidermist! Weakness: More than a few ridiculous dioramas. WTF Moment: The French Supermouse is incredible: It’s an extra-large stuffed mouse, featuring a descending zipper on its torso that reveals a Superman costume underneath!